Remember what happens in your lesson. Your lesson is the core of your musical education. The key to making the swiftest progress is remembering everything your teacher teaches you and integrating it into your own musicianship as completely as possible. So, my second suggested New Year’s Intention is to commit yourself to finding effective strategies to help you remember every detail from your lesson. First, I’ll clue you in to the important information your teacher is communicating during your lesson. Then, I’ll offer several strategies for retaining that information – you can choose which strategies to try, based on your own knowledge of how you learn best. If one strategy doesn't seem like the right fit, that's okay! Try a different one (or a combination) for the next lesson, until you find what works for you. The first type of information to remember from your lesson is each separate activity your teacher has you do, from warm-up exercises to etudes to repertoire. Carefully note what the activity is, which number or page in the book it is, and how much of it your teacher wants you to learn. I once had a student learn the wrong movement of a Bach partita because they didn’t remember the titles of the movements I had assigned. The first step is to have a clear, accurate "to-do" list for your practicing. How your teacher introduces information to you is how you should practice. If your teacher explains something in a step-by-step way, learn all of the steps, and then go through them at home in the same order. For example, I have several steps that I ask beginning violinists to go through in order to get the violin in the proper playing position. I want them to go through those same steps in that same order at home – not skip to the part where the violin is on their shoulder. I think my number one frustration with myself and my students is that we tend to play way too fast before we are ready for it. As a teacher, I’m trying to do better at assigning metronome markings for everything, so there can be no confusion about speed. But, students and parents can notice in a lesson – what speed is the teacher demonstrating? What speed do they have the student play in the lesson? Chances are, this is not an exaggerated speed for the sake of the lesson. If I demonstrate something slowly in a lesson, I want my student to practice it that slowly at home – and play it that slowly at the next lesson. You should never play faster than your teacher has assigned! Choose a speed where you can be totally aware of every element of your musicianship and play with a high-quality sound. No teacher will ever assign you to play something fast and sloppy. Asking a student to find their posture before they start playing. Physically moving a student’s hands or arms to the correct place while they’re playing. Sometimes, despite a teacher’s best intentions, you might not get to everything in a lesson. If a teacher says “We’ll do this next time,” remember it and make sure to practice it so you are prepared to play it in your next lesson. These can be some of the hardest changes to make, but some of the most impactful for long-lasting progress. For example, does your teacher ask you to take a deep breath when you’re feeling frustrated or stressed? Do they remind you that being a musician is more than what chair you sit in in orchestra? Maybe they give you an insight for a new way to approach group class or a studio recital. These are also things to process, remember, and integrate into how you approach music. What if you really tried to take a deep breath in and out every time you started to feel a little overwhelmed? What if you truly focused on the beauty of your playing and tried not to wonder where you would be sitting in orchestra? At your next lesson, notice if your teacher offers any attitude or mindset suggestions, and try to make those adjustments just like you would improve your intonation. 1. Don’t rely on your teacher’s notes. Your teacher has a lot of jobs to do during your lesson! They need to completely observe and listen to your playing. They need to notice what you have improved and what still needs improvement. They need to consider the best way to explain something for your personality and learning style. They need to decide what practice strategies to assign you. They have to think about what to assign you next, and how much of it. They need to notice cues you’re giving them about how you are feeling and if you’re learning what they’re teaching. They need to keep an eye on the clock to make sure they pace your lesson well. I give each of my students a practice chart in their lessons where I write down their basic assignments, but it’s by no means a detailed record of everything that has happened. The student (and parent) need to have their own, detailed record of each lesson that they refer to regularly as part of practice in order to make the best progress. 2. The parent takes notes during the lesson (for younger students). Using the means of their choosing, the parent should pay careful attention to everything that is happening during the lesson and take notes. If both parents are sharing music parent practice duties at home, these notes should be made easily accessible by both parents and referred to before each practice session. At the very least, the parent observing the lesson should be fully engaged, not distracted or on their phone (unless they're using the phone for note-taking), so that they can help remind their child about what happened in the lesson at home. 3. Take videos of crucial learning points. Ask your teacher if you can take a video of them demonstrating the correct posture, or a new exercise. Having the video to refer to at home will save time and leave no doubt in your mind what the right thing to do is. 4. Take outline notes in your lesson, then add full details afterwards. Students can get a notebook designated for lesson notes and keep it with a pencil on the stand. As the lesson progresses, they write down each topic being covered and a few key words to trigger their memories afterward. Leave space after each topic. Then, whether it’s in the hallway outside the studio, in the car, or as soon as they walk through the door at home, they sit and fill in every detail that they remember from the lesson. 5. Video the entire lesson, then watch back and take notes. This is the most thorough and complete way to remember what happens in your lessons, and leaves the student and teacher free to fully engage in the lesson without worrying about writing anything down. Take responsibility for bringing your own device (or memory card for your teacher’s camera, if they have one available to you) to your lesson. You should view the lesson either immediately after your lesson or first thing the next day before you practice, taking detailed notes as you go. This is especially effective for aural learners, because they can actually hear what their teacher said a second time. 6. Have a reflective conversation in the car on the way home. Talking through a lesson immediately afterward can both help a student remember what happened as well as process through any emotions they have about it. This is effective whether the parent sits in the lesson or not – the goal is to help lead the student through the lesson and to organize their memories. What was your favorite thing you learned today? What did you improve on the most from your last lesson? Can you list everything you did today in the lesson? Did your teacher remind you about your posture at all? How did they ask you to practice that? Did you learn any new ways to listen to your sound? Did your teacher suggest any new ways to think about music? What do you want to improve on for next lesson? What practice strategies will you use? What new material did your teacher give you to learn? Please notice that none of my suggested questions include “Did you get a new piece?” So much of music is about the process, and we want students to have the goal of playing everything beautifully, at high level. If a student only defines a successful lesson as one in which they ‘checked off’ a piece and received a new one, then they are bound to be frustrated most of the time! Parents can help create a growth-centered, process-oriented mindset by guiding their child’s attention to the process after a lesson, rather than the ‘result’ of getting a new piece. The goal is the creation of a child who loves music and who lets music make their heart more beautiful. Making sure that all previous goals have been met and that growth is happening is essential before moving on to new repertoire. And, asking about new material broadens the mindset of both the student and the parent. New could mean a new exercise to develop finger flexibility, or a new way to practice a difficult passage. New could mean a new etude to build technical skills outside of the repertoire. New could be a new way to think about your sound. Try very hard to avoid narrowly defining a successful lesson as one in which you "finish" one piece and are assigned a new one. 7. Refer to your lesson notes at the beginning of each practice session. ​Whichever strategy you’ve used to remember your lesson, it’s important to remind yourself of key points every time you practice. Read through your notes before you start practicing, so you know your practice aligns with what you learned in your lesson. Also, read through your notes and think about how your week of practice has gone before your next lesson so you can be prepared! I would LOVE to hear if any of these strategies make a difference in your lesson experience and music learning - or if you have other strategies that you find helpful! Please leave a comment or send me a message through the contact form to let me know how it goes! 'Tis the season, and choosing a gift that supports the special violinist in your life can be challenging! I present you with this gift guide filled with practical suggestions at every price point, drawn from my experience as a violinist and as a violin teacher. As a child, I remember always looking forward to the new CD that I would get in my Christmas stocking! (I also remember the first CD I ever received, shortly after we got a CD player for the first time...) These days, an iTunes gift card or gifting a digital album would be a great way to give a violinist music. Maintaining a violin takes a lot of equipment throughout the year, and the gift of strings, the next round of sheet music or method books asked for by the teacher, or a gift certificate to the violinist's favorite violin shop that they can use toward bow rehairs or repairs can make a fantastic gift. A durable music stand for home practice (such as a Manhasset) can be a welcome upgrade from a folding stand; likewise, for the violinist on the go, a trusty and compact folding stand for gigs and travel can make a wonderful gift. A word of warning: Violin strings are NOT created equal, and each different brand of strings will sound different on each violin. If you're purchasing strings, please consult with your violinist, their parent, or their teacher about the right brand! 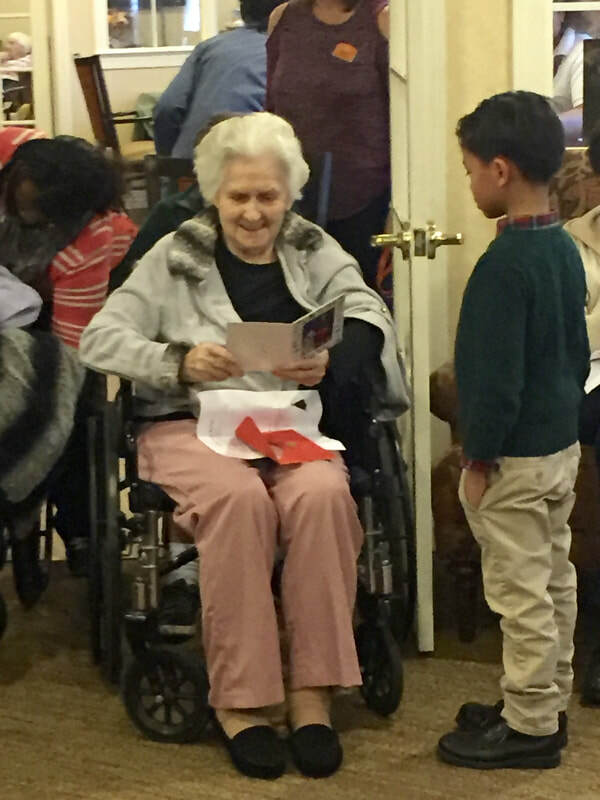 On a similar note, consider asking the violinist, their parent, or their teacher before purchasing sheet music for them - or give them a gift certificate to a sheet music supplier such as Sharmusic.com or their local sheet music shop. I still remember how disappointed I was when we bought a book that said "Star Wars" and "violin," when I was 10 years old and still in Suzuki Book 2...only to find that the Imperial March was written in D-flat major! It was frustrating and challenging to play. One of the most important part of any violinist's life is listening to music, and upgrading the equipment they listen to can be a special and valuable gift. Headphones or a speaker system can be transformative in the way you hear music. Good headphones can also contribute to protecting hearing - avoid ear buds or anything that goes directly in the ear. Choose noise-canceling headphones that fit over the ear and will reduce noise around the listener so that the volume of the music can be softer. My personal favorite brand is Bose, and I love my noise-canceling headphones (which were a Christmas gift a few years ago!). I love that I can hear all the voices in a string quartet. On my list for the future is a set of speakers for home listening. Violins, bows, and the cases to protect them are massive investments and purchases to be seriously and carefully considered. Whenever it came time to upgrade my instrument, my parents considered that my birthday and Christmas present combined for that year. I would still get a few small other gifts, but that was the big one. I think one year, my mom even moved my violin case under the tree on Christmas morning. So, if you're a parent and you are considering an upgrade for your child's violin, talk to your teacher for advice about a purchase and consider making it a Christmas gift. If you're another relative or friend wanting to contribute to gifting a violin or bow to a violinist you love, please talk to them or their parent first. Never, ever purchase a violin without the violinist - choosing an instrument is an important and special process, and they should try out the instrument and receive their teacher's approval before you purchase it. And remember, cheap instruments on the internet are never a good deal. It can cost more than what you pay for the instrument to get it functional. Amazon is not a reliable source for fine instruments and bows, nor is Ebay. If you are looking at a big investment ($2,000 or more), the best thing to do might be to put a sum of money in a Certificate of Deposit or another interest-generating account in the violinist's name for a couple of years, and then they have that money when they are purchasing their first full-size, or to put toward the purchase of a step-up or professional instrument. Cases are another option for a gift for which the giver should consult the violinist. Consider how heavy the case is, how often the violinist travels, how many bow holders they need inside the case, and if a waterproof exterior makes sense. I know that waterproofing was high on my list of requirements when I attended school in northeast Ohio. Also, ask a reputable luthier their opinion on high quality cases - what brands do they most often have to fix in the shop? I remember case shopping and being disappointed when the case that looked the most stylish was also one of the ones with the least reliable latches, according to the luthier I was working with. The moral of the story is this: holiday gifts are a wonderful way to make sure the violinist in your life has all the accessories, supplies and instruments they need to be successful throughout the year - but for the big ticket items, consult with the professionals, especially their teacher, first. It's mid-May, and here in northern Virginia, it seems like everyone is in a million places at once - myself, my students, their parents, their school teachers...it's time for standardized testing, end-of-the-school-year events, final orchestra concerts, final recitals. I've been noticing a lot of my students seeming tired, distracted, and just DONE when they come into their lessons. Here are some strategies I'm trying with my students (and myself) this week to help combat end-of-the-year stress and tension. 1. Start with a deep breath. Let yourself be where you are - your lesson, class, at home, the car. Take in a deep breath and let it out to help focus your attention in the present moment. 2. Start lessons and practicing with physical warmups and SLOW, deliberate movements. Take a few minutes to focus on your basic technique. Let your body settle into sync with your instrument instead of just launching into your piece. 3. Prioritize. Decide what the MOST important things are to you this season, and give them your all. For everything that is less important, find a little time each day to devote to your assignments so you can maintain your skills/pass the test/complete your work, but let it go from your mental load for the rest of the time. 4. Be compassionate to yourself. You can't do everything equally well. Celebrate yourself for your strengths, and recognize those things you truly love that you're doing well. Try not to beat yourself up for the other things. Recognize that you're doing the best you can. 5. Be compassionate to others. Everyone is stressed. Everyone is busy. Your busy-ness/stress isn't more important than someone else's - not to them - so don't use it as an excuse. Communicate clearly with your teachers, coworkers, friends, and family. Take a deep breath before you respond to something. Realize that everyone is tired and stressed right now, and be someone who make someone else's day better, not worse. 7. Reflect on the progress you've made. Think back to the beginning of the school year and how you played then, and compare to how you played now. What are things that have improved about your playing? What are things you've learned about how to practice effectively? What have you learned about yourself? Take a few minutes to jot these accomplishments down and to savor the feeling of progress. (Bonus: Write three goals for your summer and look ahead, just a little). The above conversation is typical of many that I’ve had with strangers, simply because I happen to have my violin with me. Now, I love violin. I love what I do. And I love to talk (and, obviously, write) about it. But, I’m not always in a mood to discuss work, or whether or not I’m making a living if I’m, say, in the grocery store, or at a train station, or walking down the street. I know that many people aren’t used to talking to musicians, so I try to be kind - I know that most people really do mean well and are genuinely curious, though perhaps they don't go about it in the best way. Despite how well-meaning someone is, as a friend of mine says, "Communication is the message received." I offer, therefore, some suggestions and guidelines for talking to that person you see with an instrument case. 1. It is never okay to talk to someone - especially someone you have just met, or who you don’t know well - about how much money they make. It’s also not okay to make assumptions about how much they make based on the age they appear, how they’re dressing, or if they have an instrument case. So, don’t. Don’t ask them if they’re making a living. Don’t ask them how they make money. Don’t ask them IF they make money. (If you’re genuinely concerned and want to help this person, see my tips for how to financially support musicians in Part 1). 2. Here are some good questions you can ask to learn more about a musician to start a good conversation (that doesn't even obliquely reference how they make money). Are you working on any cool projects right now? What’s your favorite performance you’ve ever done? 3. Please don’t be disappointed or assume that we’re not good musicians/performers if we tell you that we teach. First, just about every musician teaches in some capacity. We love what we do and believe it has an amazing effect on our world - and we want to pass that on to the next generation! Second, it can be harder to teach Twinkle, Twinkle, Little Star to a class of four-year-olds than to play the Brahms Violin Concerto. Trust me, I’ve done both. 4. If we ask you questions about you, please tell us about you and your life/work! At least for me, I love hearing how people live their lives, and having a two-way conversation makes me feel like we’re doing just that - having a conversation. Sometimes, when people ask me rapid fire questions about what I do and if I make money at it, I feel like I’m at a job interview, or like people are more interested in me as That Different Freakish Musician, not a human being like they are. Thanks for reading this! I hope some of my ideas were helpful, and I hope you’ll find ways to support the arts in whatever ways seem right for you. 1. Come to our free concerts. We need audiences!Organizations that support and fund concerts often do so through grants - and one measure of an event's success is how many people attended. Having a large audience helps us apply for more funding later on. It's also just a way to support your musician friends and to show them that you care about their work! 2. Advocate for public policies that support the arts and musicians. Call your Representatives and Senators and make sure they fund the National Endowment for the Arts. Make sure your cities and counties and school boards don't cut music programs from the public schools. Support policies for affordable health insurance for self-employed individuals who don't make their living in a traditional 9-5 job with employer-provided health care. 3. Use your networks and your social media to amplify a musician's reach. If your friend invites you to a concert, share the invite with other friends! If you listen to an album that you absolutely love, tell your friends about it and encourage them to buy it. 4. Like/Share/Subscribe. Especially now that so many social media outlets are governed by an algorithm, getting those likes early counts. So, when your violinist friend (*ahem*) posts a video from their recent recital, hit like! And if you REALLY liked it, consider sharing it. I know that YouTube in particular uses subscriber counts, so if a favorite artist of yours has a YouTube channel that you end up watching a lot - hit subscribe! 5. Leave positive reviews when and wherever you can. I know that I read the reviews before I take my car to a new mechanic, or try a new restaurant. The same goes for musicians. If you love an album, review it on iTunes, Spotify, Amazon Music, or wherever you can listen to it. If you absolutely love the quartet that plays at your wedding, find their website and social media and leave a thoughtful, positive review! If you had a great time at violin camp or your kids are loving their music lessons, find that teacher or organization on social media and on Google and leave them a great review. 6. Volunteer at an arts organization. Arts organizations are always looking for people to generously volunteer their time and talents. If you have the right skill set, offer to serve on the board and take an active role in promoting the organization and helping it grow. You can help work in the gift shop, work at the ticket office, be an usher (which can be a great way to hear amazing performances while supporting the arts! ), or any other number of jobs. If you’re looking to get involved in the Washington, DC area, I’d suggest looking at the Kennedy Center or any other number of performing arts venues. If you're looking for something a little smaller scale, get in touch with your local school's music department and offer to help out with fundraising, organization on concert nights, or ask what other ways they need your help. Thanks for reading this second part of my series on how to support musicians! Part 3 will include some handy conversation tips for how to talk to musicians without making it sound like you're asking for their resume and tax returns. Right after I graduated from music school, I noticed a shift in the conversations I was having with people. When asked what I do, I used to say, "I'm a master's student at the Peabody Conservatory." Which, you know, is very prestigious, and people were always suitably impressed when I gave that answer. Five years ago, overnight, instead of being a graduate student at a great school, I became that cliche of cliches: an unemployed free-lance musician. In the Washington, DC area, where a favorite opening line at social events is, "So, what do you do? ", this wasn't as well-received. In the last five years, I've had countless conversations with strangers who have noticed my violin case and whose curiosity has led them to ask what I play, and what I do. This is all fine. But then for some reason, an astonishing number of people decided that it was perfectly appropriate to comment on whether or not it's possible to make a living as a musician. I've gotten this from strangers in train stations, checkers at the grocery store, and even very well-meaning fellow parishioners at my church who seemed very concerned about the feasibility of my succeeding as a professional musician. Here's the thing, and I feel like this goes for any fellow human you meet: It's really rude to ask people how much money they make. It's also rude to make assumptions about someone's state of employment based on their appearance - their age, what they're wearing, or if they have an instrument on their back. It is never okay to ask someone if they're making a living doing the job that they've just told you they do (or that you've just seen them do). Being a musician is a real job. We provide services (our performances, our playing, our teaching, our time), and for these we are paid. It's basic economics. Now, since most of us are hired on a contract basis or work as entrepreneurs, we tend to lack things like employer-provided health insurance, sick days, parental leave, etc, but still. Our work is real work. (Side note: I am not disputing that it is, in fact, incredibly challenging to make a living as a professional musician. It takes a lot of long hours of preparation, and a lot of work, and if one wants to make enough money to pay rent and other bills - don't get me started on student loans! - the concept of work-life balance basically gets thrown out the window. I know exactly how hard it is to be a professional musician. I just think that when I'm making small talk with strangers, I shouldn't constantly be questioned about it or have people make judgements about me when they don't know me). If you're one of the millions of lovely people in the world who love music, who love the people who make and teach music, and who want to support us musicians in what we do, here's a practical list of actions and ways that you can directly help musicians - in the financial sense. 1. Go to a live concert. We need audiences. Even more, we need audiences who buy tickets. Also, attending a live concert is an incredibly special and wonderful experience. I think being a professional musician has made me appreciate being in the audience even more. Shut down your screens for an evening, turn off your work brain, and come let an artist take you into their world for a couple hours. 2. Buy a music album. There are more streaming services than ever, many of them free. If you want to support musicians, buy an album. The high level of skill it took to create the music on it, the cost and maintenance of the instruments they're performing on, not to mention the skill and equipment of the audio engineers needed to record and mix the album - this all cost money, much more than the $9.99 it's tempting to avoid paying on iTunes because you can stream it on YouTube for free. 3. Become a regular contributor to the arts organizations in your community, such as performing arts centers, community music schools, the arts programs in your public schools, or PBS. These organizations run on generous community donations. They want to provide you with great arts experiences - which all cost money to do. 4. Seek out and listen to local artists. If there's a cool live band playing in the bar you and your friends go to, pick up their card, find their website, and buy an album. If you love the singer/songwriter playing in your favorite coffee shop, make sure to leave them a tip - and again, go find them on the web and support them! 5. Always pay an artist's full performance fee when hiring them for your event. Ask them what their rate is, up front, and then sign the contract, abide by the contract, and pay them on time. Related: Never ask your friends/family to play for your wedding for free. If you love their music THAT much, hopefully you love them enough to pay them their full fee. Now, it's always a nice gesture if your friend/relative says, "I couldn't possibly take your money - please, accept my music as your wedding gift" - but don't assume that they will play for free. Also, they might just want to celebrate you - and not spend the party doing what they do for work. Stay tuned for Parts 2 and 3 of this new blog series, which will talk about ways to support musicians besides giving money, and suggestions for how to engage musicians in conversation without sounding like you're asking for their resume. Photos by Alice Grabowski of Blue Green Photos. 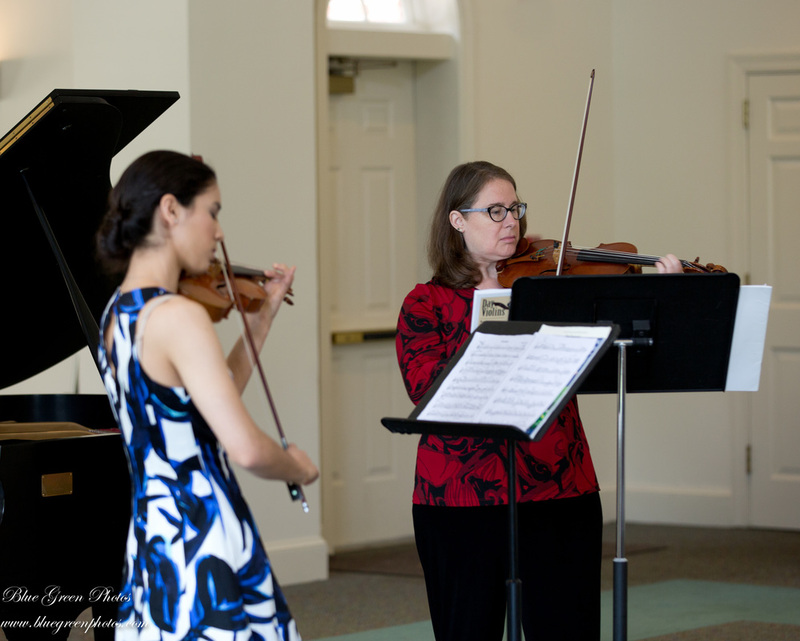 Performing Rebecca Clarke's Nocturne for Two Violins with Cora Cooper. 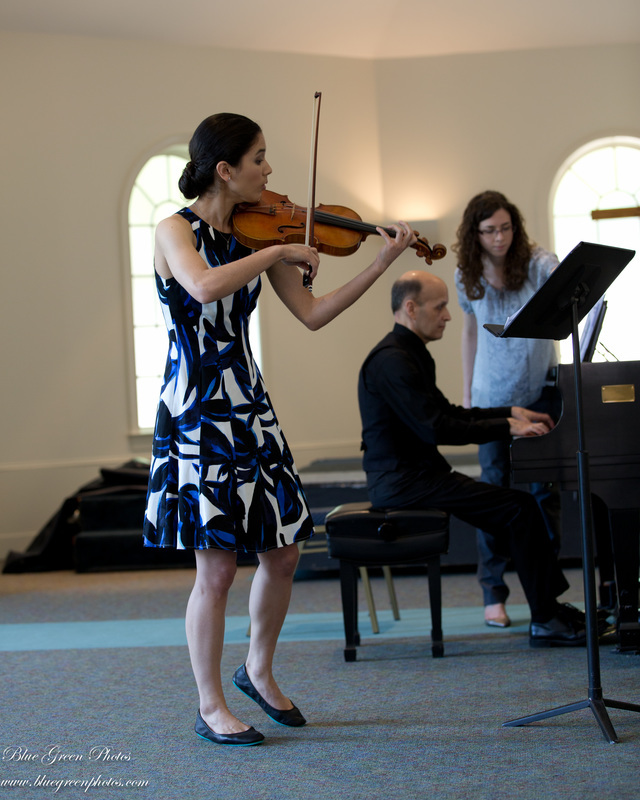 Performing Amanda Maier's Allegro Molto with pianist David Norfrey. 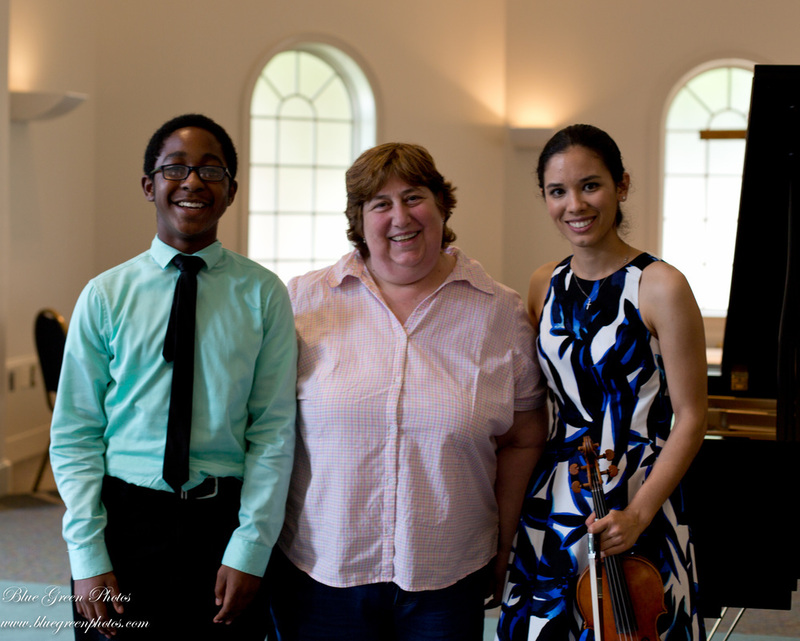 With my first violin teacher, Estelle Roth, who was also my student Ethan's first violin teacher! 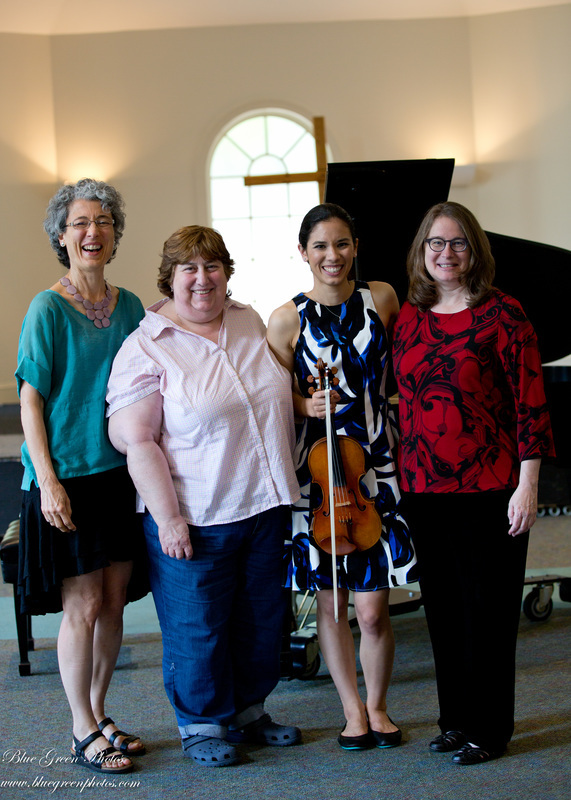 With three of the most influential women in my life: my mother, Antoinette Allen; my first violin teacher, Estelle Roth; and my new colleague and teaching mentor whose work has transformed my teaching and my studio, Cora Cooper.